As a client of athenaClinicals, we are pleased to offer EMR Integration as an enhancement to the MedXCom medical answering service system. Real-time patient information is available at the point of care directly on your smartphone. Recordings of conversations and any notes the physician makes are automatically saved back in to the patient’s athenaClinical’s chart. Because of the system’s revolutionary ability to reduce exposure to malpractice while simplifying and enhancing after-hours patient/provider communication, NORCAL Mutual, a national leader in medical malpractice insurance, is offering policyholders that utilize athenaClinicals as their EMR, up to a 10% risk management discount off their annual premium when they also become users of MedXCom. MedXCom is the most advanced athenaClinicals-integrated medical answering service available on the market today. When a patient calls in the middle of the night, MedXCom automatically reaches into athenaClinicals, grabs that patient’s chart, and displays it directly on the doctor’s smartphone in real-time. MedXCom also generates a recording of the conversation between the doctor and the patient, and pushes it back into the patient’s athenaClinicals chart automatically, along with any post-call notes the doctor makes. Documenting after-hours calls has never been simpler! MedXCom allows doctors to communicate, track, and preserve night calls with total accuracy, with the convenience and sophistication of an easy-to-use mobile app. It allows doctors and practice managers to control their on-call calendars, call rules, and phone settings without having to contact a third party to make changes. All communication made into or out of the system is recorded and archived, and is, of course, HIPAA-compliant. Because of the simplicity of documentation, the real-time display of critical patient information at the point-of-care, and the automatic call recordings which are stored for over 23 years, MedXCom reduces exposure to malpractice and improves patient satisfaction. For these reasons, NORCAL Mutual is offering new and existing policyholders that utilize athenaClinicals as their EMR up to a 10% discount off their annual premium when they also become users of MedXCom. Designed and perfected by practicing physicians, with significant input from the team at athenahealth, MedXCom truly revolutionizes how you receive and document after-hours calls. The system is fully customizable, so you can choose what options work best for you and your practice. To learn more, visit our how it works section, or call 877-633-9776. MedXCom screens every call that comes into the medical practice whenever your phone lines are directed to the service. After hours, at lunch, or during peak operating times, you control how and where calls flow, via your PC or from our smartphone app. Routine and non-urgent calls are filtered into mailboxes for follow-up at a later time by physicians or staff members. When an urgent call routes to a provider, the system checks to see how they wish to be contacted and begins the process of locating them. Most importantly, each on-call provider can set up the system differently to meet their own specific needs. Using our Voice-to-Text Transcription option, the caller’s message is sent directly to the on-call doctor’s MedXCom app, both as an audio file and a transcribd message. The doctor can then review the patient’s athenaClinical’s chart in real-time and return the call directly through the app, which always provides them with Caller ID protection. Each doctor within a practice can customize which data fields they want displayed when reviewing a patient’s chart, and in which order. 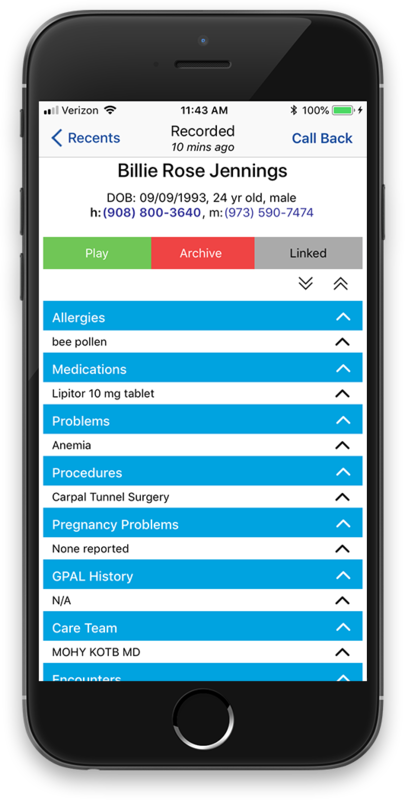 Additionally, doctors can post notes straight into a patient’s athenaClinicals chart without an associated phone call if the need arises directly from the MedXCom app. Because the system utilizes the latest technology available, the typical MedXCom client pays a fraction of what they were paying for their legacy live operator service. Find out for yourself by using our cost calculator!